Drawing his most daring inspiration from ancestral skills, Tzuri Gueta offers a modern take on the flowing and sensual beauty of lacework. Your creations are extremely innovative, yet you seem firmly attached to tradition? When I arrived in France in 1996, I felt the need to acquire deeper knowledge of lacework and its roots. I worked in the Calais workshops and learned incredibly rich techniques offering infinite creative possibilities. 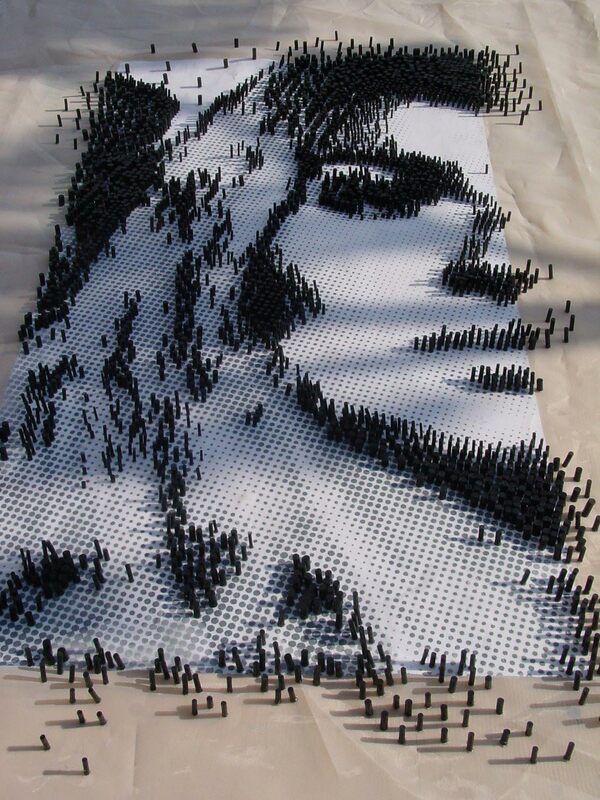 They made me want to give a new lease on life to this artistic craft. My workshop is an authentic laboratory, in which I explore textures and technologies to develop surprising creations respectful of tradition and embedded in modernity. What types of collaborative endeavors do you enjoy? I love looking around, working with designers who agree to share with me a path that leaves scope for the unexpected. This dialogue around matter and its surprises is a source of innovation. I loved entering the mystical world of Jean-Paul Gaultier and imagining highly distinctive monochrome models. And I was dazzled by the talent of Christian Lacroix, by the incredible refinement of his voluptuous materials and harmonious aesthetics. In film-making, it’s exciting to play with historical periods and to propel lace work into a futuristic dimension, as in The Three Musketeers by Paul William Scott Anderson, where Milla Jovovich wore a Victorian dress equipped with a high-tech button that triggered an explosion! What stories do you tell through your lacework? I speak of my sense of wonderment with the organic world and its fascinating structures observed under a microscope. 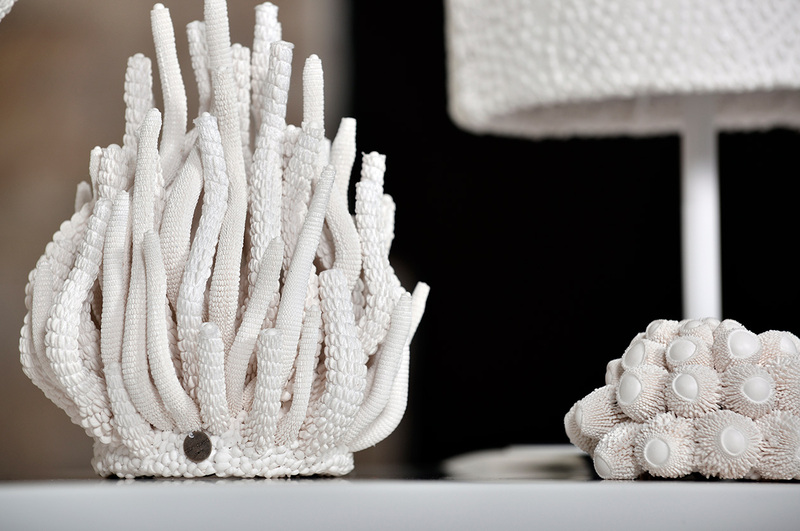 I enjoy surprising people through matter, like my ‘coral’ jewelry models with their sensual, disconcerting touch. I also love mixing aesthetic codes, as when a piece of jewelry slides onto the shoulder and becomes an item of clothing. 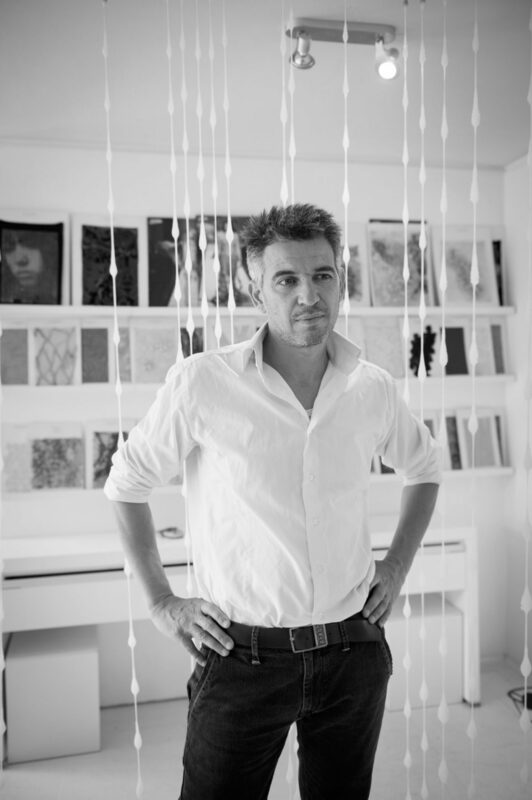 Well worth a visit: Tzuri Gueta’s atelier-boutique on the “Viaduc des Arts”, a vibrantly authentic and contemporary place pervaded by an enchanting atmosphere. 1 avenue Daumesnil,12th arrondissement of Paris. The “Art du Tissu” exhibition brought together Tzuri Gueta’s most striking textile designs at the Espace Rachi in Paris in 2002. Work measuring 150 x 60 cm, silicon on textile. Fall-Winter 2013 Haute Couture collaborative endeavor, Yiqing Yin collection. 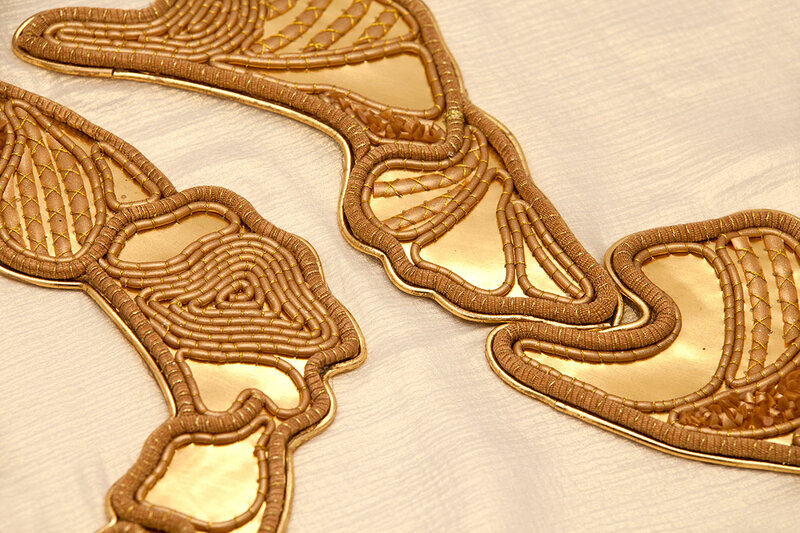 Silicon-inspired hand-embroidered textile design, silk and gold leaf, 2016. 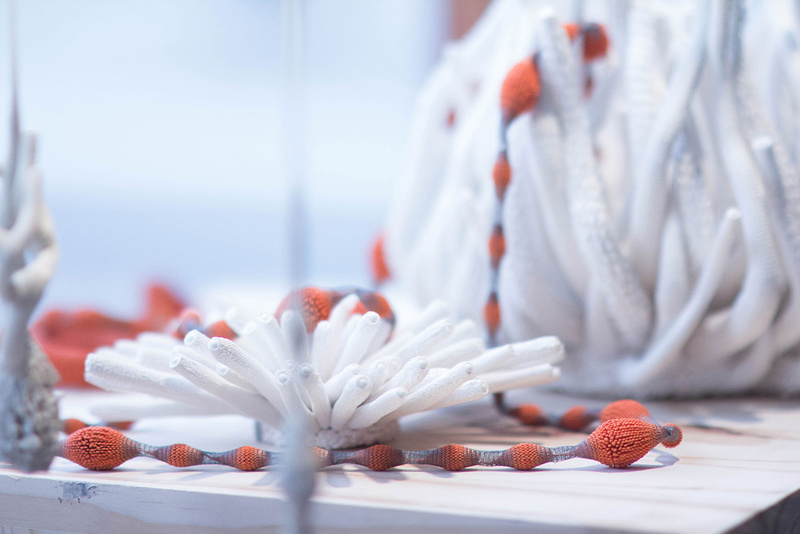 Underwater inspiration, white coral sculpture and red sautoir necklace, textile and silicon, 2016. Merinides sautoir necklace, silicon, silk and wood, 2016. 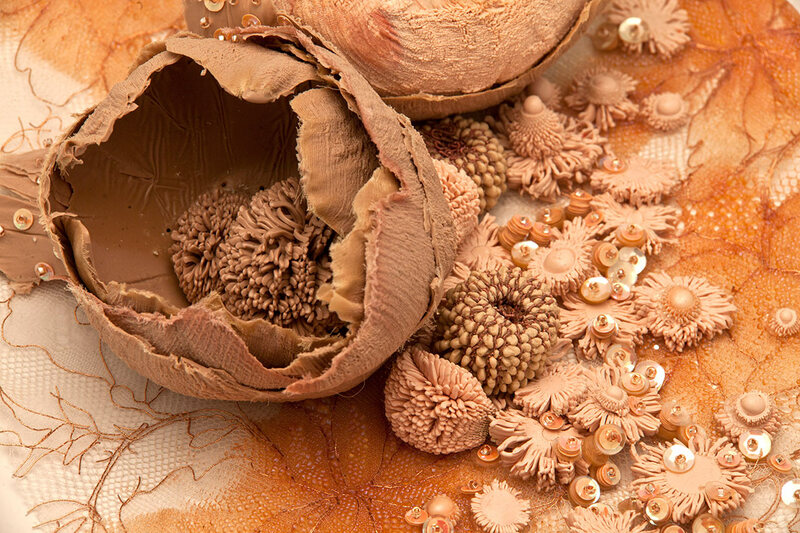 ”Algae” sculpture, silicon and textile, 2016. Silicon, silk and glass beads, 2015.